I understand that school is starting again. Like, this week. Like, maybe tomorrow. Soon. I am so not ready. Here’s how I like to start my mornings: slowly. With a cup of coffee. Here’s how I start my mornings on school days: “Put on your shoes! Where are your shoes? Where’s your other shoe? Has anyone seen the other shoe?” Times three. Yes, I understand that you have a better system for school mornings. Which is why I’m giving you this recipe. It’s a warm, hearty way to start the day (and, although I’m sure that you never have to do this, it can easily be wrapped in foil for eating on the go). And you’ll have plenty of time to make it, because I’m sure that all the shoes in your house are neatly lined up in pairs near the front door. (In my defense, it’s not me losing them; the baby rarely travels more than a few steps without a shoe in her arms. Yes, just one shoe. You see the problem.) 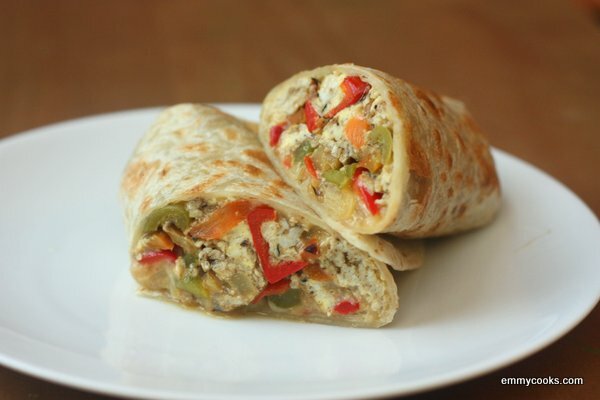 Three Pepper Breakfast Burritos: For two large burritos (or you can serve them as 4 halves), whisk three eggs with 1/2 tsp. tabil* or another spice blend (see below) and a few pinches of salt. Thinly slice three large bell peppers of different colors. Saute in a little olive oil over high heat until they are soft and nearly charred in some spots. Season peppers with salt and add another 1/2 tsp. tabil (or other spice) to the peppers, stirring for another moment to release the aroma. Lower the heat and stir in the eggs, scrambling them to your liking. Warm two 10″ flour tortillas on a griddle and melt a little cheese on each. Divide mixture between the two tortillas and roll each into a burrito. Slice in half and serve. *Tabil is a Tunisian spice blend that is used in, among other things, a dish of scrambled eggs and peppers (and tomatoes, which I didn’t use here). It lends a little bit of heat and a flavor that works very well here, but feel free to substitute a another spice blend that you like. If you’d like to make just enough of your own tabil for this recipe, mix 1/2 tsp. ground coriander with a scant 1/4 tsp. each ground caraway, garlic powder, and New Mexico chili powder. You can substitute a prepared spice blend, or use a combination of chili, cumin, garlic powder, and oregano instead (use about half a tsp. cumin and a scant 1/4 tsp. of each of the other spices). This entry was posted in Eggs, Feeding Kids, Food, Mexican Flavors, Recipes and tagged breakfast burrito, burrito, eggs, peppers, summer CSA recipes on September 3, 2012 by emmycooks. 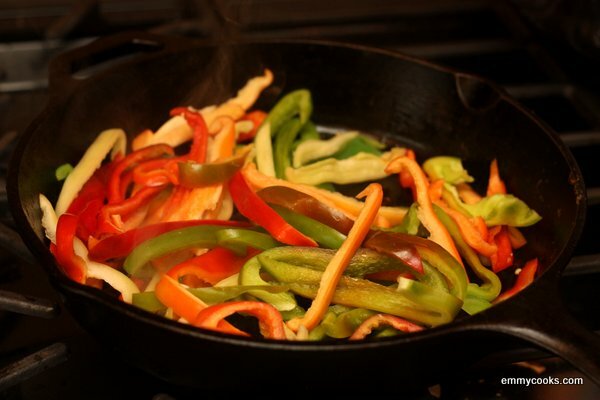 This looks delicious and is another way of incorporating those wonderful peppers into our diet. Thanks. This looks like a great breakfast! I can commiserate with the school day rush with three kids :). Have another burrito and keep your strength up! LOL. Thanks for the story – makes me feel better about the chaos here in the morning. Our dog is the thorn in the shoe procedure in the mornings. He too travels with one shoe most of the time. I love breakfast burritos. These look amazing! I don’t think I have ever cooked with tabil. Thank you for introducing me! Sounds easy to put together and really delicious to eat. I love these because I can wrap them in tin foil and send the kids out to the bus stop with one. Last year my son used them to warm his hands in his pockets during the winter before he ate them while waiting for the bus. Can I just say how amazed I am that you are the mother of three and manage to blog DAILY. Kudos, seriously.